I made a quick bento this morning without any characters in it. Only punched some daikon flowers with the cutter and placed them on the top of the rice. Inside the box I put stir fry chayote & corn, cherry tomato, five spice pork that I cooked in my pressure cooker last night, and salted duck egg. I only needed to stir fry the veggies, reheated the five spice pork, and salted duck egg was boiled last night. So it was pretty quick to put everything inside the box this morning. Kids just got back to the school last week and they already had many home works and projects. Couldn't believe it. Big A is more responsible to do her home work & school projects on her own while Little A always needs to be reminded about his home work & school projects every now and then. So I must check his school agenda everyday after school. And I will need to sit down with him to see whether he needs any helps to do his homework or school project. Your bento with small daikon's flower is so pretty and cute^^ (I'm sorry I'm french I don't speack very well english!) 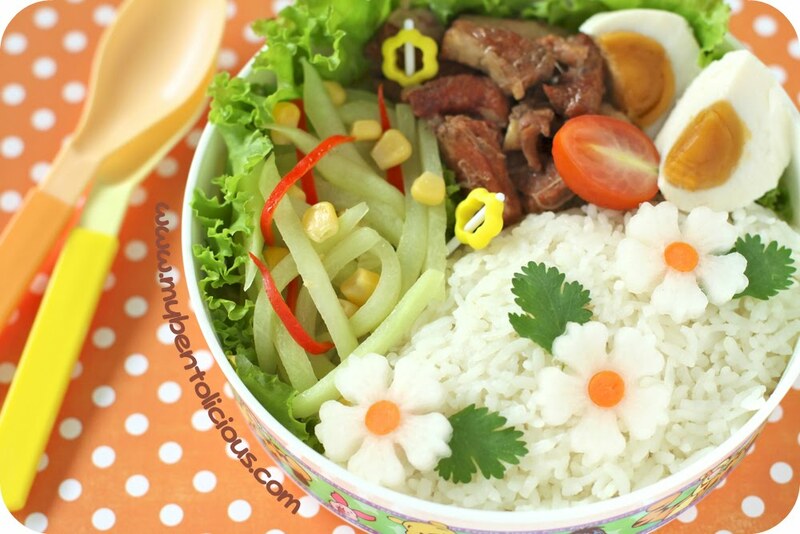 but I love your blog ^_^ Thank you so much for your creative bento!!! @Julybentos : Thanks a lot July for your sweet comment! Normally would you prepare next morning breakfast or lunch for kids nite before?need your advice...thanks...cos sometimes i really so rush in the morning, wondering if can prepare those next day bento a day ealier. Your works never fail to satisfy my eyes, Lia. This one also makes me curious for the taste hm hm hm... must be yummy. It’s a lovely non-charaben bento. Love it! @tatabonita : Aku juga suka banget tapi kalo 5 bisa bisulan besoknya Ta LOL ... :D Daikon fresh rasanya kurang enak, mungkin karena nggak biasa makan mentah2. Kalo yg kulitnya pink malah lebih strong lg rasanya. Lebih strong dari rasa wortel dan dari yg kulitnya putih. Kebanyakan aku masaknya buat sop seperti soto Bandung atau pakai iga sapi / babi.